Launceston's Early Newspapers | Launceston Then! The earliest newspapers in Launceston were published in 1832. In order to appreciate the circumstances of their origin and their short existence, it is necessary to refer briefly to the political situation in the country as a whole. William IV succeeded his brother George IV, on the throne on June 26, 1830. For many years the Tories had been in power, but in November following the new monarch’s accession they fell, and Lord Grey formed a Ministry of Whigs. After a great struggle they passed the Reform Bill, which became law on June 7, 1832. One of its principal effects was to take away 143 seats from the pocket boroughs and give them to towns, such as Leeds and Birmingham, which had previously been unrepresented. In the boroughs the old and various systems of franchise such as that of pot-walloppers at Newport, were replaced by a uniform £10 household qualification, and the boundaries of the restricted parliamentary districts were considerably extended. The most drastic local effect of the Act was the abolition of both seats for Newport and one for Launceston. The Members for the former at that time were Viscount Grimston, and Major-General Sir Henry Hardinge; there for the latter were James Brogden and Major-General Sir John Malcolm. Another effect of that Act was to give the vote to qualified householders in the parishes of St. Mary Magdalene, St. Thomas, St. Stephens, South Petherwin and Lawhitton; a list published on September 1, 1832, contains 262 names. 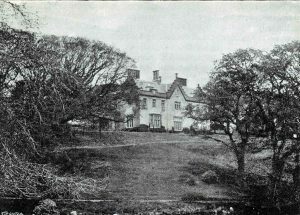 The question of which, if any, of the four sitting Mmebers was to be nominated as the sole representative of the borough under the new arrangements was settled by the third Duke of Northumberland whose grandfather, the first Duke, had purchased 1,104 acres of the Werrington estate for £41,000 from Humphrey Morice in April, 1775, in order to be able to exercise the patronage which went with it. He selected Sir Humphrey Hardinge, who, in spite of having lost his left hand in battle at Ligny in Belgium, had had a distinguished military career. In his favour, John King Lethbridge, the Launceston solicitor and the Duke’s local Agent, stood down, although he appears to have begun some preliminary canvassing. To fight the General at the election on the 11th and 12th December, the Whigs secured as their candidate David Howell, of Trebursye, who though that the enlarged electorate might give him a majority. If e may anticipate the sequel, he led at the end of the first day’s polling, but was beaten on the second, and Hardinge retained the seat through the next three General Elections – those on January 7, 1835; July 24, 1837; and June 29, 1841 – and a bye election on September 15, 1841, rendered necessary by his appointment as Secretary-at-War. He continued as Member until 1844, when he was appointed Governor-General of India and raised to the Peerage as Viscount Hardinge. Possibly at first he simply quibbled be referring to squibs, but these ceased to a large extent when the newspapers appeared. On receiving this letter the Tories decided that they had no alternative but to issue a newspaper of their own as a counter-blast to ‘The Reformer.’ They called it ‘The Guardian,’ and it was to be published every Saturday morning by T. and W. R. Bray. It was printed in a room over a stable opening off Castle Dyke. Richard Robbins, then aged fourteen, tell’s us in one of his manuscripts written in the winter of 1898-99, but not published until 1957, when it appeared under the title ‘Voice from the Past,’ that the stable contained barrels and that the floor of the room over it “was far from close and by standing on a barrel in the stable we could hear the proofs read, with the consequence that, on the following morning its contemporary would appear with an answer. ‘The Guardian’ generally appearing first these prompt replies made a deal of merriment.” Robbins was employed by ‘The Reformer’ to carry copy from leader-writer to printer as well as to listen to the reading of its rival’s proofs. The first number of ‘The Guardian’ appeared on July 28, so that on that day the people of the town had two journals, No. 1 ‘The Guardian,’ and No. 2 ‘The Reformer,’ and so they went on until October. Each paper was priced at one penny. They were the same size, each consisting of four pages, measuring about 12 inches long by 10 inches wide, except that on August 11 ‘The Reformer’ had so much to say that its increased its pages for that week only, to nearly 18 inches in length. On September 1, a ‘supplementary number’ was published consisting of four pages; theses should have been numbered from 29 to 32, for both journals numbered their pages consecutively throughout their existence, but actually they were numbered from 30 to 33, so that there is no page 29 in the series, but two pages 33, for the issue of September 8 is called No. 9 and runs from pages 33 to 36. The ordinary issue of the earlier week is called No. 7, so that the supplementary number is intended to be No. 8, although this does not appear on it. This accounts, therefore, for ‘The Reformer’ being nominally two numbers ahead of ‘The Guardian’ from this time onwards, though, until the end of August, it was only one ahead due to its having begun publication one week earlier. Although each paper set up for itself some standard of decency. both descended, almost at once, into depths of scurrility. The second number of ‘The Reformer’ said that the writers on the other side “have become infuriated, and, foaming at the mouth with madness, they drop their foeted spume in reply to unanswerable argument.” This was in the second editorial; in the first, the Tories were called “Infamous blasphemers, apt pupils of the Father of Lies.” In reply ‘The Guardian’ advised “our fellow townsmen to treat his slander as the puny effort of ill-directed, undeserved, and indiscreet malignity.” Later it dubbed its rival Editor as “this forger of lies.” These and similar phrases became all too common as they were thrown from one to the other. Epithets were continually being produced and the slanging match went on. Some of the shorter barbs were “the besotted quill-drivers of ‘The Guardian,” “I shall live in hope… that he may not one day be found among those who, whilst they had the brightest emanation of the Deity upon their lips, had still the blackest principle of the devil deep-rooted in their hearts,” “The Editor of ‘The Guardian’… by persisting in following the example of his father, the devil, sins against light and knowledge,” “The Editor of ‘The Reformer’… steeped up to the chin in Gall,” “He personifies the shuffling fellow who lies by halves, who falsifies facts and timidly embroiders a groundwork of truth with false details of his own invention,” “This slanderous, slimy reptile,” and much more of greater length on both sides. These brief quotations typify the tone of the whole of both papers, whatever may have been the effect of such masses of vituperation on the people of that time, this writing is extremely tiresome to read today. The ‘enclosed account,’ also bound in the volume, is a manuscript of two thousand words, containing the allegations on which the questions quoted in the previous paragraph are based. It attacks each of the eight Aldermen of the unreformed Corporation with unbridled scurrility, some of it so disgusting that even ‘The Reformer’ would hesitate to print it. It is impossible to say who were the real editors of these two newspapers, but they were educated men. Latin phrases abound and there are frequent classical and other allusions; sometimes there are wrangles about grammatical constructions. A close perusal suggests that Charles Gurney was responsible for ‘The Guardian’ and wrote a good deal of it, and that David Howell himself, probably assisted by the E. Monson mentioned above, edited ‘The Reformer’; certainly Howell spent a great deal of time in Eyre’s printing establishment. If we go back a bit and examine the evidence, we may find that the closing sequence of events supports this supposition. To this there was no reply, for ‘The Reformer’ did not appear again; nor did ‘The Guardian,’ the issues of October 20 being the last. Howell fought Hardinge again at the next General Election, a little more that two years later, but was beaten so decisively that the Whigs did not put up another candidate for 39 years, and thus Launceston remained, in effect, a pocket borough for that period and the Duke continued many of his benefactions to the town. It is of interest to note that after his two defeats, Howell sole Trebursye to W. A. H. Arundel, and left the district. He bought Ethy, in St. Winnoe, from the Mount Edgcumbe family and resided there until his death in 1845. Thomas Eyre sold his printing and haberdashery business to William Cater in 1833 and emigrated to America. After Arundell’s death, Trebursye passed into the hands of Howell’s arch-enemy, Charles Gurney. Fifty years after the issue of these newspapers only three copies – two complete and one incomplete – were believed to have survived; today (1963), after 130 years, two copies are known still to be extant; there may be others. One of these sets, carrying the bookplate of William Monson was found in a second hand bookshop in 1952. It has two pages more than the other, issued as supplements to ‘The Guardian’ on September 1 and 15 respectively, and printed on one side only. These old papers are valuable as contemporary sources of local history, for, after all the scurrility and exaggerations and partial truths have been eliminated, there remains certain basic statements of facts which are not obtainable elsewhere. There is, for instance the question of the temporary suspension of the Grammar School a few years before the newspapers appeared Sir Alfred Robbins says that it was closed in 1821 and not re-opened until 1838. We know the latter date is correct because it be verified from the manuscript ‘minutes’ of the reformed Town Council, where there is a record of the appointment of the new Headmaster, Rev. J. H. Kendall. But a routine check on the grant paid annually by the Crown raised doubts in the writer’s mind about the accuracy of the date 1821. From the time of Queen Elizabeth, the Crown had paid £17 13s. 3 1/2d. subsequently reduced to £16 12s. 3d. a year as part of the endowment. When the school closed, no payment was made, though the accumulated arrears were sent when it was re-opened. When Kendall was appointed, the Corporation received £227 15s. 11d. as arrears. This would be the sum due for less than 14 years, depending on the amount of interest, if any, allowed, which would suggest that the school was not closed until 1824 or 1825. Previous Headmasters of the Grammar School had sometimes assisted the local incumbents by taking service for them. A search through the registers of the neighbouring parishes showed that Rev. J. C. Hicks officiated as a number of burials at St. Mary’s in the years 1819 to 1824. In these entries he is described as ‘Master of the School.’ This evidence confirms that obtained from the financial calculation. Hicks followed Rev. J. H. Hutton. Turing to the rival newspapers, we find statements by contemporary writers which settle the matter definitely. One of them is “There has been no Master for this School these seven years past, to the great injury of the sons of the various tradesmen in the town.” ‘Seven years past’ before 1832 takes us back to 1825. From the other side in the following week came a reply which did not dispute this date, but gave reasons why Hicks left; “The monies…applicable to the purposes of a Grammar School, would, according to his statement, amount to the annual sum of £41 12s. 7 1/2d., a sum the smallness of which is…the sole cause of there being no Master of the Grammar School at the present time, and indeed since Mr. Hicks left; it is evident to every person who recollects the school which that gentleman had, that even with this annual sum and the monies to be received from his scholars, he could not raise anything like sufficient remuneration to repay him for the labour which he was required to use. Mr. Hicks after using endeavours by every means in his power to increase his school, but without success, and feeling that no proper remuneration could be obtained, was induced to leave; the same feeling, which was the cause of his leaving, has prevented others from applying for his situation and thus caused, as a necessary consequence, the giving up the school for the time.” We learn also from a later issue that “the Rev. Mr. Oxenham applied for the school about two years ago, and came to Lanson on the Subject,” but that he was not appointed. This is an agreed fact not recorded in any ot the writings on the school; the wrangle arose about the reasons why he did not stay. The proposal to make a new road on the western side of the Castle is another question on which these old newspapers throw some light. Until 1834 the only way into Launceston from the north was the very steep hill with gradient 1 in 5 1/2, from Newport to North Gate, and thence straight up the further hill or by way of Tower Street, then called Back Lane. The North Gate was smaller than the South Gate, and, following complaints from farmers about the difficulty of getting carts through it, it was demolished in 1832. This is the date given by Peter in his ‘Histories of Launceston and Dunheved’ and the one which is generally accepted, though Robbins says it was 1834. The removal of this ancient monument made the entrance to the town somewhat wider, but did not alter the inclination. It was decided therefore, to build an entirely new road with a more gradual slope, nowhere exceeding 1 in 11, on the other side of the castle. This was not opened for traffic until 1834, two years after newspapers had closed down, but preliminary matters were being discussed in 1831 and negotiations were proceeding while journals flourished. “With reference to my letter to you communicating the purport of our Surveyor-General’s Report on the subject of the land required for the New Road near Launceston, in which I informed you that, with a view to the legal interest of his successors, His Majesty would be bound to receive the sum of £84 7s. 6d. (being the share of the King in right of His Majesty’s Duchy) and to invest it in the three per cent Consols, I have now the pleasing task of informing you (which I am enabled to do by a letter I have received from Sir Herbert Taylor) that, with that gracious consideration which the King has ever evinced, to extend his royal beneficence towards those objects which may so materially benefit His Majesty’s good subjects in Cornwall, and so essentially contribute to their comfort, as the completion of this New Line of Road near Launceston, it is His Majesty’s intention to grant of His Majesty’s Duchy Revenues a present donation of £200 and, if it should be required, His Majesty will next year be pleased to grant a further donation of £100 towards this object.” Sir Henry Hardinge also received a letter on the same lines. The facts above are undisputed, but the usual vituperative wrangle arose at the meeting when the question was raised whether Pendarves or Hardinge had brought the greater influence to bear to obtain the King’s gift. This quarrel continued for weeks; it assumed county proportions and was the subject of correspondence in ‘The West Briton’ from August 3 onwards. A long letter from Thomas Pearse, which appeared in that paper in the issue dated August 24, was reprinted, together with a list of voters, by ‘The Reformer’ on September 1 as a ‘Supplemetary Number.’ The details of this wrangle are not of interest today, but, when the bitterness had died down and the construction had been completed, the King’s generosity was acknowledged by calling the road from the present Guildhall Square to the present National School ‘King William Street,’ and is so named on old maps. The Cornish and Devon Times story.